This past weekend, I had friends visiting us from Switzerland. I wanted to make a special Italian dinner for them. One that was not a typical Italian-American dinner but a dinner with dishes that are particular to Tuscany; one of their favorite places to visit. Dinner was big hit. Melt the butter in a soup kettle and cook the onions, covered, for 10 minutes. Stir in the flour and cook for a minute. Add the salt, pepper, honey and wine and heat until the wine reduces a bit. Add the broth, bring to a boil, lower the heat, cover the pan and simmer for 2 hours. Serve in individual bowls garnished with the crisps. Mound 3 level tablespoonfuls of cheese in 5 inch long strips about 2 inches apart on the baking sheet. Bake until the cheese is melted, soft and a very light golden color, about 5 minutes. Remove from the oven and place the baking pan on a cooling rack. Do not disturb the crisps until completely cooled and firm to the touch, about 20 minutes. Using a thin spatula or knife, lift the crackers from the baking sheet. Make Ahead Tip: Store in an airtight container for up to 4 days. Combine 2 cups of all-purpose flour, yeast, sourdough starter, sugar, butter, egg and salt in an electric mixer bowl. Beat 3 to 4 minutes. Add baking soda to the whole wheat flour and blend into the flour-yeast mixture. Add cheese and remaining flour to make a soft dough. Switch to the dough hook and knead until smooth (5 to 8 minutes). Place in a greased bowl; turn once. Cover; let rise until double (1 ½ to 2 hours). Punch the dough down. Cover; let rest 10 minutes. Preheat the oven to 375 degrees F. Oil 2 baking sheets. Divide the dough into 24 pieces and shape into balls. Place on the oiled baking sheets. Cover; let rise until double (25 to 30 minutes). Bake at 375 degrees F about 20 minutes. Heat the oil in a 12-inch skillet over medium heat until shimmering. Add the grapes, shallots and broth and heat. Stir pepper and salt into the grape-onion mixture and continue to cook, stirring frequently, until the grapes are soft but still retain their shape, 3 to 5 minutes longer. Reduce heat to medium, stir in the grilled sausages, wine and oregano and cook, scraping up any browned bits, until the wine is reduced and the sausages are hot. Arrange the sausages on a serving platter and spoon the grape mixture over the top. Drizzle with the balsamic vinegar and serve. Bring the broth and cream to a boil. Add salt and butter, then while stirring, slowly pour in the polenta. Stir until there are no lumps, then turn the heat down to a bare simmer. After 5 minutes, stir in the Parmesan and turn off the heat. Cover the pan until ready to serve. Heat olive oil in a skillet over medium heat. Stir in onion and garlic; cook about 5 minutes. Add frozen peas, and stir in stock. Season with salt and pepper. Cover, cook until the peas are tender, about 5 minutes and serve. Preheat the oven to 325 degrees F. Set an oven rack in the middle of the oven. Butter a 9 inch springform pan. Sprinkle the pan with amaretti cookie crumbles to cover the bottom and sides of the pan. Place the pan on a rimmed baking sheet. In a large bowl of an electric mixer, combine the ricotta, orange zest and sugar. Mix to combine. Beat in the flour. Add eggs, 1 at a time, and beat until incorporated. Add the amaretto liqueur and salt. Pour batter into the prepared pan. Bake in the center of the oven for about 75 minutes, until a light golden color. Make sure the center is firm and the point of a sharp knife inserted in the center comes out clean. Cool completely on a wire rack. Cover with plastic wrap and transfer to refrigerator until chilled, overnight or at least for 2 hours. Remove the sides of the pan and serve with fruit sauce. Combine the water, lemon juice, amaretto, sugar, salt and cornstarch in a small pot. Whisk until smooth. Add the cherries and stir. Bring to a boil over medium heat and cook for 5 minutes, stirring occasionally. Remove from heat and let cool. If you want to serve it warm, you may do so; simply let it cool until it is warm, not hot or cover and refrigerate to store. July has an abundance of vegetables and fruits available, so I try to incorporate as many as I can into my weekly menu. I made a few dinners last week that utilize these seasonal fruits and vegetables and I hope you like them as much as we did. Serve with a mixed green salad and some hot biscuits. Heat oil in an ovenproof 12″ nonstick skillet over medium-high heat. Cook the sliced sausage, garlic, bell pepper, mushrooms and onion until the vegetables are soft, 3–4 minutes. Add asparagus; cook until wilted, about 1 minute. Stir in the sliced potatoes and salt and pepper. Stir in half the basil and the eggs and reduce heat to medium; cook until golden on the bottom, 8–10 minutes. Sprinkle the cheese on top and place the skillet under the broiler. Broil until set and the cheese is melted, about 3 minutes. Garnish with remaining basil before serving. Last week my CSA had melons aplenty. I received two Crenshaw and one yellow watermelon. So I came up with a few recipes to make. The melon salad is in this post and next week, I will share the melon soup recipe I made. When you make the salad try to use two different types of melon for contrast. I also like the balance of the tangy grilled shrimp with the sweetness of the fruit salad. I also served this salad dinner with some homemade cornbread. See the recipe for Cheddar Cornbread here. 4 cups yellow watermelon, peeled and seeds removed. Combine the salad dressing ingredients in a blender. Set aside in a serving bowl. In a mixing bowl combine the two types of melon with the grapes. Refrigerate until ready to serve. Just before serving, mix the melon and grape mixture with the toasted pecans and a little of the basil dressing. Serve additional dressing with the salad. Prepare an outdoor grill for medium hot heat or heat an indoor stove-top grill. Thread the shrimp onto skewers and brush them lightly with BBQ sauce. Place the shrimp skewers on the grill directly over the heat. Cook for 2 to 3 minutes. Turn the skewers and cook for another 2 to 3 minutes. Take care not to overcook. Remove them to a plate and serve with lemon quarters, the melon salad and cornbread. Basil is so plentiful this time of year, so I try to think of different ways to use it in my summertime cooking. Of course, freezing basil pesto for the winter months is also another option. It is also a great addition to salad dressing and omelets, as in the recipes above. Cut a thin slice off the top of each zucchini. With a small spoon (I like to use a grapefruit spoon) remove most of the flesh from the zucchini without cutting into the outside. Chop the cut slice and the flesh. Heat the 1/2 tablespoon of oil in a medium skillet and add the chopped zucchini, chopped sausage and the garlic. Saute until the zucchini is completely cooked and has lost its moisture. Add the onion, bell pepper and tomatoes, cook until soft. Add enough breadcrumbs to hold the mixture together, about 2 tablespoons. Remove the pan from the heat and allow the mixture to cool, about 30 minutes. Stir in the cheese and fill the hollowed out zucchini shells with the mixture. Drizzle the zucchini with olive oil. Pour about 1 inch of water into the bottom of the baking dish. Place the baking dish in the oven and bake for about 40-45 minutes or until the filling is golden brown and the zucchini shells are tender. While the zucchini are baking, cook the pasta in salted boiling water until al dente. Reserve ½ cup of the pasta cooking water and drain the spaghetti. Return the drained pasta to the cooking pot and add the pesto with a little of the cooking water to thin the sauce a bit. Add the Parmesan cheese and black pepper. Mix well and serve alongside the stuffed zucchini. What To Cook In July? Here are some suggestions on how to use July’s bounty to create delicious, seasonal meals. You may have noticed that in a few recent salad recipes, I have not cooked the corn before adding it to the salad. Corn, this year, has been plentiful and sweet and I found the salads taste better if the corn is uncooked. The dressing permeates the corn and it tastes quite fresh. Figs and Pecans are also in season here where I live, in fact, the figs are from a friend’s tree. If figs are not available in your area now, you can save this recipe until they are. Peppers and tomatoes are plentiful now and melons are at their peak. Cut 2 rounds from a the center of a ripe, peeled cantaloupe and remove the seeds. Center the rounds on 2 dinner plates. Combine one 6.4 oz package of tuna, ¼ cup diced onion, ¼ cup diced celery, 1 teaspoon Dijon mustard and ½ cup mayonnaise.. Place half the tuna salad in each cantaloupe round. Cut 3 hard-boiled eggs in half. Remove the yolks to a small bowl and mash them. Add 1 tablespoon finely chopped onion and 1 tablespoon finely chopped celery. Add a little sprinkle of salt, ¼ teaspoon Dijon mustard and 2 tablespoons mayonnaise. Mix well and use the fillings to stuff the egg whites. Arrange on the salad plate and sprinkle with chopped parsley. Add sliced fresh tomatoes to the salad plate and serve with warmed cornbread or rolls. Mix the corn, green pepper, jalapeno, tomato and red onion in a bowl. Stir in the olive oil, the lime juice, honey and salt. Mix well. Refrigerate for a few hours or overnight to marinate. Garnish with chopped parsley and serve with tortilla chips. Lay corn tortillas out on a baking sheet and drizzle with a little olive oil and lime juice. Sprinkle with chili powder. Cut the corn tortillas into fourths. Bake at 400 degrees F until crispy, about 15 minutes. Once they come out of the oven, squeeze more lime juice over them. Serve with the corn salsa. I like to poach chicken in broth for salads. Place 2 cups of water with a salt free chicken bouillon packet in a medium saucepan. Add a little salt and pepper. Bring to a boil and add the chicken. Lower the heat and cover the pan. Cook the chicken about 15-20 minutes or until they are white through the center. Cool in the broth. Drain the chicken and dice. Save the broth for when you need chicken broth for a recipe. Place the diced chicken in a mixing bowl with the remaining ingredients, except the pecans. Chill. By hand, break half of the pecans into pieces and stir into the salad. Arrange the salad on a serving plate and decorate with the remaining pecans and garnish with parsley. Whisk together the flour, cornmeal, baking powder, salt, pepper and cayenne in a medium bowl. Make a well in the center and add the milk, egg, honey and cooled melted butter. Whisk together the wet ingredients, then incorporate the dry ingredients (do not over mix). Mix in the corn and cheese. Heat the oil in a large nonstick skillet over medium heat. Working in batches, drop heaping ¼-cup portions of the batter into the skillet and cook until golden brown and the cakes are cooked through, 2 to 3 minutes per side. Serve the corn cakes topped with Roasted Tomato Salsa. Mix the ingredients together and allow to rest at room temperature until serving time for the flavors to blend. Just because summer is over and the season for berries, peaches and melons has passed, it doesn’t mean you can’t enjoy fruit desserts. 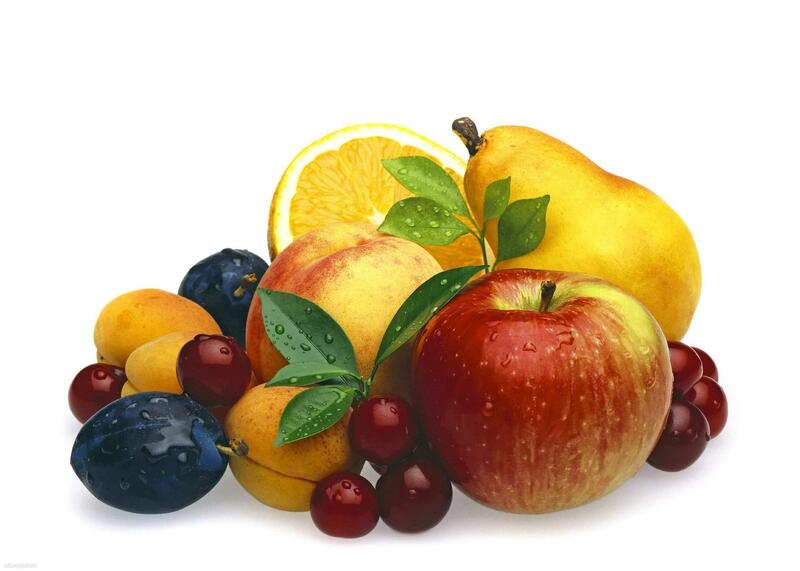 Fall brings us apples, plums, pears, figs, grapes and pumpkins. No matter which fruit you pick up at the market, there are so many delicious desserts that you can make. A warm apple pie, a sweet plum tart or a delicious pear crisp are all terrific to enjoy on a cool fall night. Preheat oven to 350 degrees F. Grease a 13 x 9 x 2 inch baking pan; set aside. In a very large bowl combine flour, sugar, baking soda, salt, and cinnamon. Make a well in center of flour mixture; set aside. In a medium bowl combine eggs, oil, and vanilla. 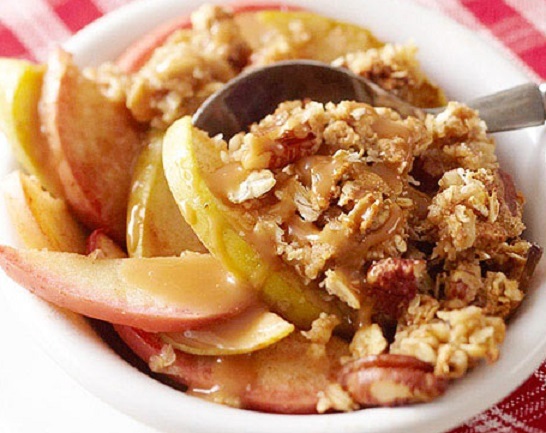 Stir in apples and nuts. Add egg mixture in the well in flour mixture, stirring just until moistened (batter will be thick). Spread batter evenly in the prepared pan. In a medium bowl beat cream cheese with an electric mixer on medium to high-speed. Beat in egg yolk, orange marmalade and ginger. Divide the pastry dough into four portions. On a lightly floured surface, roll each dough portion into a 7-inch circle. Spread each portion with one-fourth of the cream cheese mixture, leaving a 1-inch border. 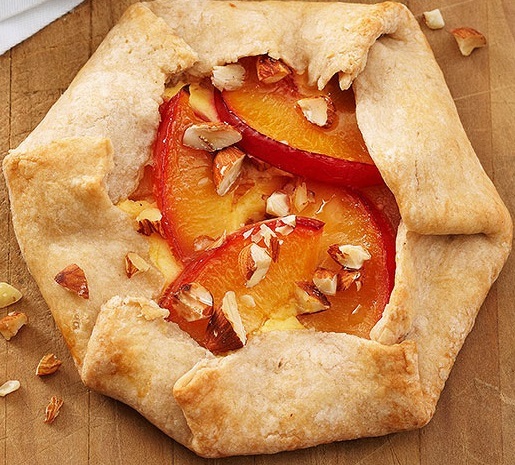 Top with plum slices and almonds. Fold border up over the filling, pleating pastry as necessary to fit. Place galettes on prepared baking sheet. Brush tops and sides of the crust with milk. Bake about 30 minutes or until the crust is golden brown. Serve warm. Cut each in half and drizzle with honey. In a small saucepan heat and stir 2 tablespoons of the butter over medium heat until light brown; set aside to cool slightly. In a medium bowl stir together all-purpose flour, sugar and salt. Using a pastry blender, cut in the 2 remaining tablespoons of butter and the browned butter until the mixture resembles crumbs. Sprinkle 1 tablespoon cold water over part of the mixture; toss gently with a fork. Push moistened dough to the side of bowl. Repeat moistening flour mixture, using 1 tablespoon cold water at a time, until all of the flour mixture is moistened (2 to 3 tablespoons total). Form dough into a ball. Preheat oven to 350° F. Place paper liners in 24 muffin cups. In a medium bowl, beat cream cheese and sugar until smooth. Add the egg and beat on low just until combined. In a large bowl, beat the pumpkin, sugar, oil and the 4 eggs until well blended. In small bowl, combine the flour, baking powder, cinnamon, baking soda and salt. Gradually beat into the pumpkin mixture until blended. Fill the muffin cups one-third full with batter. Drop a tablespoonful of filling into the center of each cupcake and then cover with the remaining batter. Bake at 350°F for 20-25 minutes or until a toothpick inserted in the pumpkin portion comes out clean. Cool for 10 minutes before removing from the pans to wire racks to cool completely. Store cupcakes in the refrigerator. Preheat the oven to 375 degrees F. Coat a 2-quart square baking dish with nonstick cooking spray. Mix the sliced fruit with the granulated sugar and place in the prepared baking dish. In a medium bowl stir together the oats, brown sugar, flour and cinnamon. Using a pastry blender, cut in butter until mixture resembles coarse crumbs. Stir in the nuts. 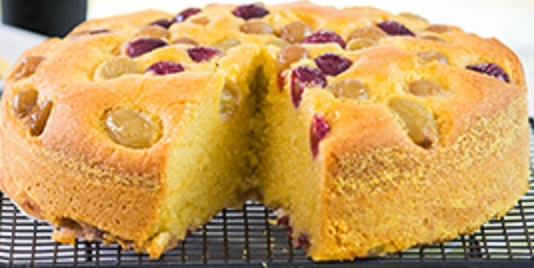 Bake for 30 to 35 minutes or until the fruit is tender and the topping is golden. If desired, serve warm with frozen yogurt. Preheat oven to 350° F. Spray a 9-inch round baking pan with cooking spray and dust with the extra cornmeal. Shake the pan to evenly coat all sides and the bottom and tap out the excess. Stir together the flour, cornmeal, baking powder and salt in a mixing bowl. Set aside. Place eggs and sugar in the bowl of an electric mixer and beat on medium-high speed until light and fluffy, about 3-5 minutes. Turn mixer to low-speed and slowly add in the olive oil. Beat in the milk, vanilla extract and orange zest until well incorporated, about 1 minute. Slowly incorporate the flour mixture into the wet mixture, a half cup at a time, while mixing on low-speed until all the dry ingredients are incorporated. Using a spatula, transfer the batter to the prepared baking pan. Disperse the grapes evenly over the top of the batter. 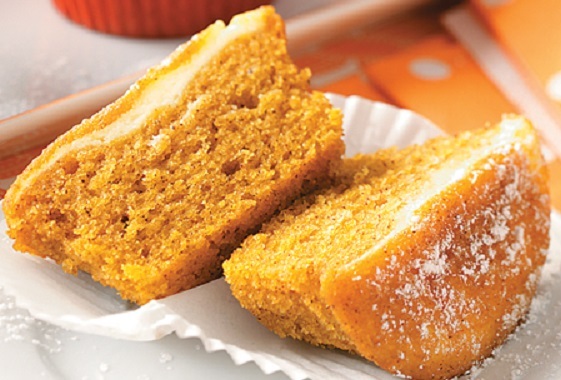 Bake for 50-60 minutes or until a toothpick inserted into the cake comes out clean and the cake is golden brown. Remove the pan from oven and place it on a wire rack to cool for 5–10 minutes. Turn pan over and remove the cake. Let the cake cool completely, grape side up, on the wire rack. Place the wine in a heavy saucepan over medium-high heat. Bring to a boil, reduce heat to medium low and allow the wine to simmer until it has reduced by half, about 15-20 minutes. To serve, slice the cake and drizzle the wine reduction over the cake.